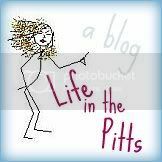 Life in the Pitts: Not a satisfied customer. We got Comcast a few weeks ago. Before that, we were just stealing our internet from the neighbors. And I didn't even feel bad. Kurt did, but until I had a job we couldn't afford to pay for internet. And once I had a job, I kept "forgetting" to remind him about it. I feel the same way about this as I feel about downloading music illegally. I know, I know. I am a bad person. But we did get Comcast. Not because I had a moral change of heart, or grew a conscience, or anything like that. Nope, it was because when you're stealing internet, and the router needs to be reset, you can't exactly go knock on their door and ask the owner to do it for you. Comcast internet worked great for a few days. Super fast. BUT THEN (aren't those the worst words? ), it started slowing down. Even though we constantly delete the browser history. And I have to reset it all the time. WITH A WRENCH. And that doesn't always fix it! Have you guys got any internet stories? Please tell me. I used to steal Internet from a neighbor, and most of the time it worked fine. Unless it was night time, and then their connection slowed down to a crawl. I imagine that this is because they were actually home from work and using it to play World of Warcraft (I had no idea whose connection I was leeching on, so this is a total guess). God that was the worst. Hey if they don't block it with a password, I say that its free for the taking. My internet was really awful when I first got it...or so I thought. Like you I cleaned history browser and cookies everyday. I did a disk clean up and defrag everyday too..it would work ok for a little while then slow right back down. I could not download anything and everything was just a hassle. I finally figured out what the problem was for us. Our security settings were set so high. We had got a new computer and decided to use the security suite offered by our internet provider. It changed the setting to high instead of medium and wasn't letting anything through. Now I can download and open as many windows as I want and my internet is super fast. See if that is whats up with yours...its worth a shot. I thought I was going to have to buy a whole new computer...again! When we lived in Florida we "borrowed" internet...we would move the computer around to get the best connection...just picture us with a really old laptop holding it in ackward positions to get a connection...personally i didnt feel bad about it i thought if they didnt want to share they would have put a password on the internet connection. My internet at work got SHUT OFF last week because of copyright infringement. It would seem that someone (staff or student?) started illegally downloading all of the Harry Potter audio books for funzies... and the TV shows "Mercy" and "Lost". Apparently, big brother IS watching AND He really DOES care about that whole illegal download thing. Moral of the story: You really should grow a conscience, and stop thieving that which is not rightfully yours. What Marilyn said reminded me of the time our internet was shut down a long time ago because I downloaded the movie Mean Girls (it was worth almost worth it lol) But it was only off for a day, we just had to call the cable company and promise never to do it again. The lesson here is that if you're going to download things like that you need to be more careful about it. I don't see a problem with using an open wifi connection. It is so incredibly easy to password protect a connection, that if it's open then well...it really is free for the taking and the owner's fault if they didn't want to provide a public service. Really, if you're savvy enough to own a router, you should already know the basics of how a network works and that if you don't secure it, others can use it. And actually there is a big movement right now where people leave their connections open on purpose to allow others to use them. When you are using somebody else's connection it's especially important to be careful about what you're doing on their network though. Maybe someone is borrowing your internet and that's why it has gotten so slow? Other than that I have no ideas... Sorry, I'm no help. However these comments made me laugh! ps. you aren't a bad person. Everybodys doing it. Michael and I were going to steal... I mean borrow... other peoples internet when we first moved into our place, but everything was password protected for some reason. Comcast is the worst service ever in the history of cable/internet providers. I was constantly having to either reset the router or call for service---and I hated calling for service because they always had you perform the most lamest of steps you already tried before you placed the call. The only advice I could offer is trying to update the firmware on the router, if you haven't tried that already. If your firmware is outdated, the router will struggle with the connection. I've had great luck with AT&T for the past 3 or 4 years. I will never use Comcast again. Ever. Ok---I'll elaborate a little more on why I was so unhappy with Comcast---in addition to the the crappy connections. A while back---and this goes back a few years---the cable industry opened up to allow other companies to compete with Comcast (a government ruling). This is how I ended up getting AT&T (at the time, it was called Wide Open West---AT&T bought this company). Anyway, I went to my local Comcast office to return my equipment and their computer system was down. They were writing down everyone's information and we were told when the computer system was up, it would be entered into the system that we returned our equipment. Everyone in line was there for the same reason---returning equipment and going with Wide Open West. Six months later, I get a call at work from a collection agency telling me that I owe them 375.00 for a cable box and router that was never returned to Comcast! Turns out, Comcast never entered my info into the computer system that I had returned the equipment. And, they turned my account over to a collection agency. It took me over a year to get this settled and taken off my credit report---even with all of the proper documents that I saved from the day I turned in the equipment to Comcast. It was a complete mess and it almost reached the point where my wages were going to be garnished by the collection agency. Heeheehee! My brother and I use to steel cable when we were kids. He’s older than me and had to know how to do it. My parents never knew.....they would have flipped. We use to watch cable when they weren’t home and the second we heard the garage door open we would change it to a local channel. We use to take turns listen for the garage door. I just my Mom we did this a few weeks ago. She was shocked! orry your having problems with your cable. We have AT&T, love it and have had no problems so far.